Tell us what you see! You may create a caption or a short story. Keep the entries G-rated, please. The best, most creative answer wins a beautiful, shiny trophy. You may submit as many entries as you like. This round's judge is our last winner, Cue! Judging will be done as close to Sunday evening as possible. I love it! Great stone work. Oh no: where am I gonna put the nail for my Xmas sock? River Rock Monster is getting fired up for Halloween. Few people know that before painting, Jackson Pollock designed fireplaces. 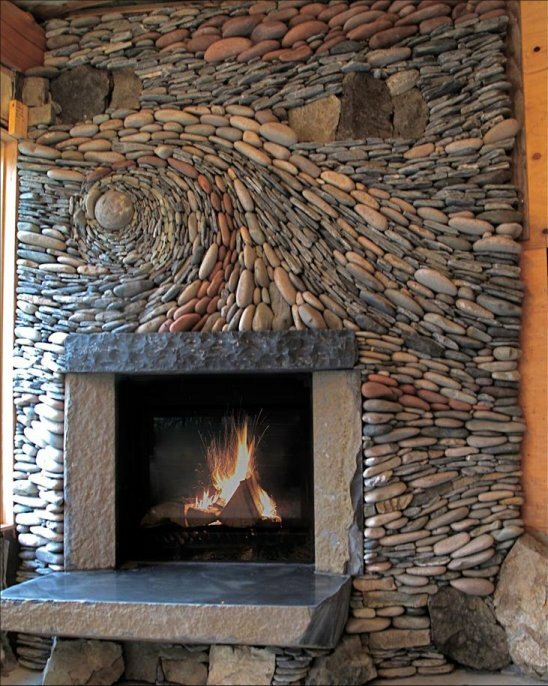 If you solve the rock puzzle correctly, a portal will open above the fireplace. "That's the last time I make a fireplace when I'm stoned." Bricklayers lay brick, but stonemasons simply ROCK! Using a magnetic resonator Rocky was able to create geodemagnetic designs in his wife's craft room. When happens when the Amish drink beer. Wow...a lot of great ones here! I like so many of them. DocPaul: "That's the last time I make a fireplace when I'm stoned." Wow thanks! That was quite a wild fireplace. Congratulations to DocPaul on his 61st trophy!